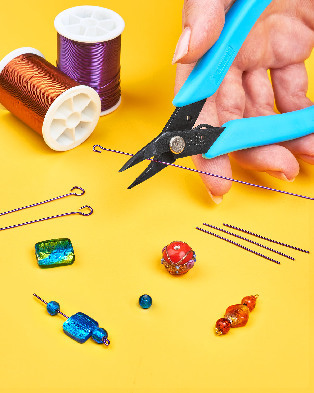 A new combination shear and long nose pliers that is especially great for amateur and professional jewelry makers who travel with their projects for business and pleasure has been introduced by Xuron Corporation of Saco, Maine. The Xuron® Model 485C Combination Shear-Long Nose Pliers features a cutter and chain nose pliers in a single tool for cutting, holding, bending, and forming wire used in all types of jewelry making projects. The cutter is ideal for bead wire and soft gold or silver wire up to 12 AWG (2.05 mm dia.) and the pliers have smooth and rounded outside edges that form without marring. Eliminating multiple tools, the Xuron® Model 485C Combination Shear-Long Nose Pliers employs by-pass shear cutting that makes perfectly square cuts and the chain nose tips are tapered to fit into tight areas and make small bends. Manufactured from durable high carbon steel with a non-glare black finish, it has soft Xuro-Rubber™ cushioned grips and return spring.